Another wasted movie for McConaughey's filmography. I went into the movie not sure what to expect. But the fact the movie was a true story was interesting. I think it shows the struggles in Detroit, even for a white family. It shows the life of Rick Jr, which happens to be a roller coaster. I think mainly because there is no true father figure or family support here available to him, and it is also clear that the politicians can't create such a government that allows the low class in these urban places to rise. hikayenin defalarca izlenmiş olmasından "yaratıcı ekip" dahi sıkılmış gibi zira eldeki malzemenin nasıl kurutulup söndürüldüğüne, nasıl ton olarak bu kadar renksiz kalabildiğine şaşırtıyor. elbette iyi bir senaryoyla bambaşka bir işe dönüşmezdi ama en azından iyi bir kapalı anlatı olabilirmiş. geviş getiren ve nerede neyi öne çıkaracağını bilemeyen, biraz da politik olarak münasebetsiz bir iş. An uneven yet entertaining little film. Worth a watch. 2 extra points for Danny Brown cameo LOL!! Dull and boring despite fine acting and nice production design. White Boy Donnie Brasco this ain’t. Quite solid, but not so good that you can forget that you've basically seen it all before. 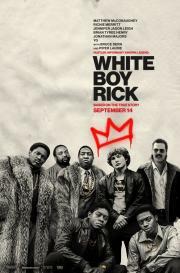 It’s difficult to know how to feel about what happens to Rick Wershe, Jr. at the end of White Boy Rick, and this makes it difficult to decide how I feel about the movie. If the film wants us to take a side, I can’t tell which it is. This makes me dissatisfied with the film, which is a disappointment because I like and care about this character, and Richie Merritt as White Boy Rick does a nice job playing him. Being the youngest informant might make for some interesting conversations at parties but it doesn't make someone interesting. Can't not love a movie that has Danny Brown's laugh in it. Sometimes it moves too fast, sometimes you don't see things that you really should see, but when it actually settles down and tells its tale it can be fairly compelling stuff, especially since McConaughey is great here. The problem is that since there is so much average stuff in between the few scenes where it's allowed to breathe it has a hard time building momentum. I can't call it "good" but it's pretty close. Would've been a lot better if they showed anything he did to get arrested.